Biometrics have improved gun safe security immensely over the traditional mechanical and electronic locking mechanisms, as it ensures only those with proper authority can open the locks. That’s what we’re going to be looking at today – the best biometric gun safes. The following guide offers an overview of biometric gun safes and why they offer great value and security for handgun and rifles owners. The comparison chart below lists the top available biometric gun safes on the market. You’ll notice that all except one are made for handguns. That’s because there just aren’t many biometric rifle safes around. Simple, affordable and reliable are the main things you get from the Barska AX11224 Biometric Gun Safe. It is a 31 lb. unit that can store many handguns, some ammo and still have sufficient space for other important items. Because of the shape of the safe, how many pistols you’ll be able to fit inside it mostly depends on how you organize the items. The biometric scanner sits at the center of the door along with LED lights that will indicate access or refusal of access. The unit comes with two backup emergency keys just in case you need to open it and those whose fingerprints are registered aren’t around. The computer is able to save up to 30 fingerprints which allow you to use different fingers and multiple users. Overall this is a mid-sized unit measuring 16.25 inches wide, 14.25 inches deep and 7 inches high on the inside which makes for more than enough room to other accessories aside from the handguns themselves. 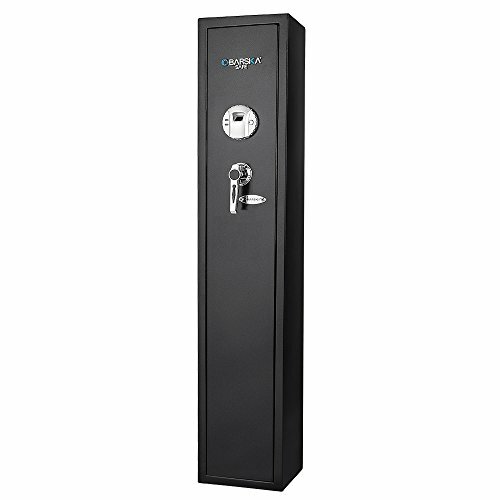 One of GunVault’s entry into the biometric gun safe arena is the MicroVault XL MVB1000. This costs around $200 and is built to give you a low false rate of rejection. The irritation some people get when their prints aren’t recognized correctly by the computer is one of the reasons why fingerprint safes aren’t as popular and widespread as they ought to be. GunVault uses better recognition software that reduces the false rejection errors making it easier to open the MicroVault MVB1000. The MVB1000 uses a spring-loaded door system that makes it convenient to open the lid and you can register up to 120 fingerprints if you wish. This is a lightweight unit reinforced with 18 gauge steel to protect it from intruders. The inside is lined with soft foam to prevent any damage to your firearm. On the inside of the door, you have integrated pockets where you can leave small items and documents. The size of the unit makes it ideal if you want something that can fit in a desk drawer or be brought with you in your vehicle. Slightly smaller and cheaper than the Barska Biometric Safe above, the Viking VS-25BM Fingerprint Safe comes with a responsive fingerprint sensor that offers excellent reliability. Similar to the Barska above, you’ll be able to fit multiple handguns in it as it is 13.6â€ wide, 9â€ deep and 9.6â€ tall. This one lets you store 100 fingerprints maximum though I really doubt you’ll need that many. The amount does give you the freedom to scan some of your fingers more than once, using different angles. This makes accessing much faster since no matter what angle you happen to place your finger on the sensor it will be able to match it. Complementing the speed and accuracy of the recognition system is the good fit the door is designed with which prevents anyone with a crowbar from inserting its tip between the creases to try to pry the door open. The VS-25BM is also built with heavy gauge steel on all sides keeping it protected from all angles, something not all safes do. The one minor issue with this model is its insides aren’t lined with foam or other soft materials which can allow any metal on metal items to scratch either the unit’s insides or your pistols. 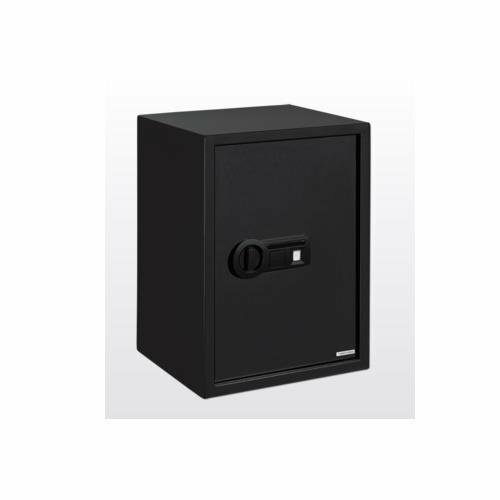 Our next selection for the best biometric gun safes is the LockSAF PBS-001 fingerprint safe. If you’re willing to pay extra for quality this is among those to put on your shortlist. 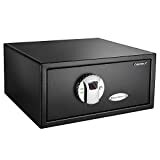 It provides you with a strong 9 gauge steel construction which is difficult to compare when it comes to safes of this price and size. It also comes with one of the fastest accessible biometric sensor and scanners for gun storage safety devices. This provides you with better recognition compared to other models. Though the number of recorded identities is limited to 10 fingerprints. While the unit makes use of a 9-volt battery, the computer’s memory is able to keep the data when you run out of battery so you can just insert a new battery and still have all your saved information as they were. It fits 2 handguns and some clips in its dimensions of the close of 14 inches long, 10.25 inches deep and 4.56 inches in height. Firearms up to 12 inches long will fit into this unit. The inside is layered with foam lining which makes the surface soft for any metal items. Underneath this, you’ll find 4 pilot holes that can be used to mount the unit in different hidden locations. If size is an issue and you want to be able to organize the contents of your safe, the Stack-On PS-20-B Biometric Safe includes two removable shelves that allow you to divide the inside of this 13.8â€ by 12.25â€ by 19.75â€ safe. The biometric system holds as many as 32 fingerprints through the unit gives you additional options as it comes with a 4 button front panel where you can save a code that has between 4 to 8 digits. A third option allows you to use the backup key to open. The manufacturer also creates a slightly smaller version of the PS-20-B, in the form of the Stack-On PS-10-B which costs $50 less at $100. The PS-10-B also uses fingerprint recognition and comes with similar features except you get a smaller space and only one removable shelf essentially splitting the inside into two partitions. There aren’t many of them around, but if you have long guns and prefer using a biometric access safe, the Barska Quick Access Long Gun Safe will give you good value for your money. This $255 firearm storage system is divided into the upper and lower shelves. The lower of which fits 4 rifles while the top lets you keep additional pistols or other accessories. If your rifles are equipped with scopes or you want to store them loaded with magazines, the capacity will be cut in half allowing you only two instead of the four. The biometric scanner and computer system are similar to the ones used in other Barska fingerprint safes though this one has a large capacity of 120 identities that can be saved. It is easy to operate allowing you to quickly save your data without much hassle. It also performs fast recognition which isn’t always the case. For the price, you aren’t going to find many long gun safes with fingerprint accessibility similar to this one. Here is a perfect biometric safe for those who want to store a single handgun in ready to use condition. Designed to fit a standard J or K frame sized revolver or nearly any common semi-automatic. Able to be opened with just a single hand and featuring a pry-resistant design, this is an ideal choice for a biometric safe where you just need to keep a home defense or personal carry weapon secure. This is probably the most common sort of safe design, built to fill a large and important market. Often defensive handguns are misused by minors leading to tragic results. Securing them even in a simple biometric safe helps keep your family safe and protected. Bottom line, this is a great safe if you need to store a single gun, have exclusive access to it, and have it stored someplace easy to get to, while still being fairly secure. It’s a basic, simple biometric safe and does what it is advertised to do and not much else. Another one gun biometric safe, the SpeedVault is much as its name implies; a speedy way to access your firearm and keep everyone else away. Like any other one gun safe, this one fits most commonly carried semi-autos and revolvers. Unlike most biometric safes though, the SpeedVault features a unique wall mounted design that quickly makes your firearm available to you. It also can store up to 120 different fingerprints, making it perfect for security companies and other organizations that may either share the same firearm among multiple authorized persons or simply to have one safe available over different shifts to different users. And naturally, it works great for giving married couples access to a home defense gun while keeping it away from children. 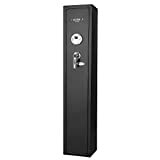 Designed to be pry-resistant and to provide a natural form of access when mounted, this is a truly marvelous biometric safe worthy of consideration. You’ll love this safe if you have multiple authorized users, or prefer the wall mounted design. Otherwise, it’s as suitable as any other single gun biometric safe out there, although it may be a bit easier for a criminal to pry off a wall and break into at their leisure, so if that is a concern you may wish to consider other models. While much focus is made on the best biometric safes for pistol storage, there is less focus on storing rifles and shotguns, which is a pity, as any firearm can benefit from a quality biometric safe to store it in. It is easy to forget that shotguns are popular home defense weapons, and in some settings, particularly in rural areas, so are rifles. After all, four-legged predators are a thing along with the traditional two-legged kind. 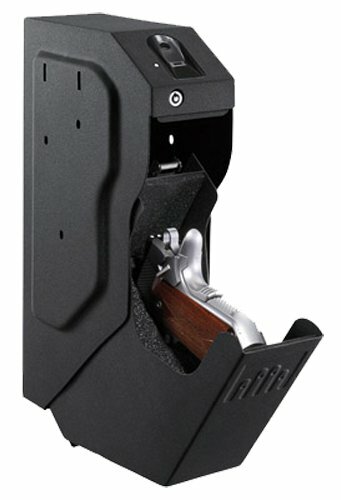 Capable of storing up to four longarms, as well as several handguns or spare magazines in the top shelf, the Barska Quick Access safe is California DOJ approved as a storage device (an increasingly important consideration given how California keeps doubling down on highly restrictive gun laws) and can store up to 120 fingerprints, which as we looked at before, makes it very useful for institutional use, or simply in a home where two or more people may be authorized users. Regardless, this is a true universal biometric safe, and one that can readily present ready to use rifles, shotguns and handguns when needed, or simply add an extra layer of biometric security to your gun collection. This is a dandy little unit, and there are larger ones available, but if you’ve just got a few rifles to store, or want the flexibility of a larger biometric safe, it’s hard to beat this one size stores all types of guns and accessories safe. Install in a closet or even bolt it down in your garage. I’m a big fan of wall safes, simply because they are much harder to steal than other safes. Even bolted down safes can be stolen, especially small ones, while larger ones depend on heavyweight and awkward size to keep them from being taken. A good biometric wall safe solves most of those problems and doesn’t take up any real room in the house. This model from Viking features padded shelves and walls and is suitable for not only storing a handgun or three but also other small valuables and important paperwork. Use it for your home defense pistol, spare cash, jewelry, gold and silver bullion, crucial documents and more. 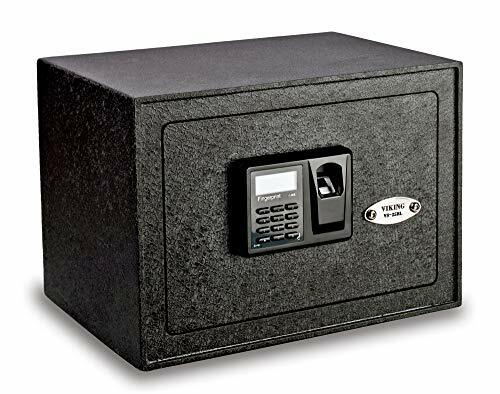 Modestly priced, and built like a tank, this is a perfect biometric safe for your gun and valuable storage needs. The best part about wall safes is how easily their very existence can be hidden from the casual observer. Stick them behind a picture, tuck them into a closet behind your clothes, maybe even set them sideways in your floor. The possibilities are endless, and the flexibility of a wall safe is rather hard to beat. Add a biometric lock to the whole thing, and you’ve got yourself a real winner here. This type of safe is based on advanced biometrics which make use of the unique fingerprint identification pattern each person carried. This more advanced Gun safes measure, read and scan the physiological characteristics of the hand and specifically the fingerprints. In the future, we may see more advances like retina scanners and other things that can tell one human being from another. The biometric gun safe is also often called a fingerprint gun safe as these secure storage units are equipped with biometric fingerprint readers that engage and disengage the locking mechanism allowing or preventing an individual from getting into the safe’s contents. Because our unique prints are used these safes can only be opened by the true owner, most allow a single person access whilst more advanced models allow multiple prints to be saved. Not all states mandate firearms be secured from unauthorized persons or that they are locked up or secured at all times. In fact, only one state requires all guns to be locked or secured. Here is a quick rundown. When in doubt, consult local and state laws to make sure you are in compliance with any safe storage laws in your state or local area. California – requires guns be secured from children and unauthorized persons. Biometric safes are a fantastic way to do this. Connecticut- guns must be secured from minors. Consider using a small single gun biometric safe if you need to have a loaded handgun handy, yet secure. Massachusetts – firearms must be secured from unauthorized use. Biometric rifle and multiple handgun safes ensure this law is followed. New York – Prevent minors and unauthorized persons from accessing firearms. Choose any suitable biometric safe combination. Needless to say, this is not a comprehensive examination of safe storage laws, and due to the ever-changing nature of gun laws, particularly in traditionally left-wing leaning states, it is difficult to ensure up to the moment accuracy. In addition to some laws requiring safe storage, many states require gun locks be provided with the sale of firearms or certain types of firearms, and you may choose to use those in conjunction with a biometric safe. However, you are the final arbiter of those decisions. It is of paramount importance that you verify compliance with storage laws yourself. Having said that, other states do not require guns to be securely stored when not in use, but may impose criminal or civil penalties for unauthorized access. Texas is one such state, and there are others. However, regardless of the law, the responsible gun owner knows that just as their lawfully owned gun is the first line of defense in a home invasion, secure storage is the first line of defense against the criminal or negligent misuse of firearms by unauthorized persons. Trigger locks can be easily defeated with simple hand tools or even cable cutters depending on the model, and are very difficult to quickly remove in case of an emergency. Traditional locking gun safes using either a key or combination lock can be rather secure, but gaining access to them in an emergency can be difficult, especially if you have to fumble for a key in the middle of the night. Children can readily find hidden keys or key rings, and may in turn gain access to a simple locking safe, defeating the whole purpose. Combination locks prove to be even more frustrating and can be easily compromised if anyone else learns the combination. Or worse, if you forget it you lose access to your guns and will require the expensive services of a locksmith. Same goes for losing the key to a keyed safe. Some safes now are made with an electronic lock that requires entering a PIN like code to unlock, but that suffers from too high of a risk of the code getting out, or being forgotten, which leaves you with a simple keyed safe and all the associated problems thereof. Biometric safes, therefore provide the best means for rapid acquisition of a firearm by only authorized users. You never forget your fingerprint, and as long as you change the batteries in your safe (consider changing them at the same time you change your smoke detector batteries each year) you never have to worry about fumbling for a key in a time of need. They are also keyed as a backup, and as long as you carefully secure your key, then you have about as secure and fast opening a safe as possible. 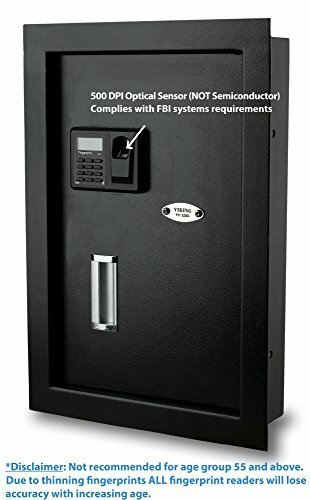 Biometric safes are uniquely keyed only to limited individuals and provide a hardened line of defense against the wrong persons gaining access to your firearms. At the moment, most of the fingerprint accessed safes are suited for handguns variety. That’s because the current technology that’s commercially available today still isn’t able to deliver the precision that the upper-end brands (those selling for $1500+) have. This is the reason why you seldom see a biometric rifle safe, though Barska (a well know gun safe manufacturer) has a number on offer, such as the Quick Access Rifle Safe, if you’re interested in taking a look. For a shortlist of the top long gun safes, see buyers guide here. You’ll also notice that depending on the manufacturer and the model, some of the fingerprint safes come with an electronic lock which allows you to add your own security code as you would electronic lock safes. This offers its owners of the choice of using either method to access the unit’s contents. This is my preferred method as it provides greater flexibility when storing your guns and you always have a fallback option should one of the mechanisms for opening the safe-fail. Your first and foremost consideration should be what you plan to do with it. Are you storing one or two handguns? Multiple longarms? An assortment thereof? Do you require fast access to a functional firearm, or do you just enjoy the ease of use and functionality of a biometric safe? Or are you after something else entirely different? The greatest value in a biometric safe is the ability to store a loaded, functional and ready to use firearm in a secure, locked container and greatly restrict who has access to it. We’ve all seen horror stories of children, or other unauthorized users getting their hands on firearms and going through everything from horribly tragic accidents to brutal murder and mayhem, and these often could have been stopped with just a little foresight and care in securing the firearm. While there may be times when you can have the classic loaded revolver in the nightstand, or shotgun by the door, the stark and harsh reality is that those circumstances are increasingly fewer and farther between, and it is important (and sometimes mandated!) that you keep your personal defense gun secured. This, of course, raises the age-old problem of compromising civil rights, responsibility, ease of access, and all manner of safety concerns. While there is no perfect answer, there are a great many potential solutions, ranging from the draconian to the absurdly unsafe. This means the most common choice in biometric safes is that of a small unit that will store a commonly sized handgun, be it revolver or semi-auto. 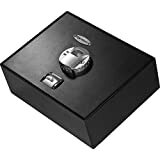 The benefits of these small safes are that they are also portable and can be readily mounted or unmounted and moved around if needful. Many people will bolt one to a wall, or on a closet shelf, the floor under their bed, inside their car, or really any place that you might commonly want to store a loaded handgun. Other biometric safes are more traditional wall mounted units that have more space, including for multiple or larger sized handguns and more accessories or spare ammo. Of course, their utility is somewhat reduced as well due to their size and installation method. If you need to have a loaded shotgun or rifle handy, there are of course biometric safes that fill that bill as well. Cheaper ones hold about four rifles or shotguns and there are larger ones available. Any of those will work great for keeping ready to use longarms or handguns at hand but have even more restricted placement locations due to their large size and bulk. Making the decision to get the best biometric safe for gun storage that you can find is a no brainer. They are a logical choice for highly secure and accessible storage. They are affordable, easy to use and often meet or exceed safe storage law requirements. They are available in a number of different sizes and forms to suit most any need or budget. Single handgun sized models can be quickly and easily deployed where you need them most, ensuring you have fast access to your self-defense handgun, and that children cannot get to it. Satisfying the legal and moral responsibility to secure your firearms against unauthorized use, and to make them less of an attractive target to theft means first and foremost getting a safe, and we’ve seen that a biometric safe is perhaps the best choice for at least some of your gun collection, so go ahead and choose the one that fits your needs. You’ll be glad you did. 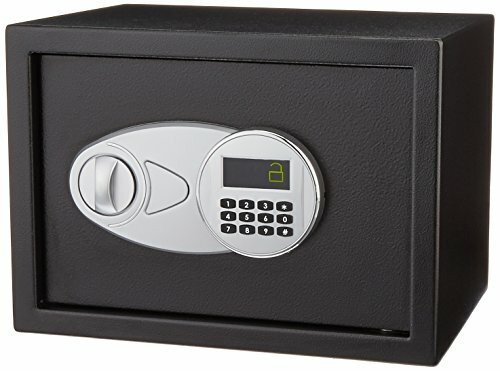 What you get with these types of safe is the same solid steel construction, the same strong hinges, and the same interior as you would a mechanical or electronic lock device. The only major difference is the mechanism that controls the locking bolts isn’t the dial combination (mechanical lock) or a numeric keypad (electronic lock), instead, there is a small programmable computer system installed in the unit and all you see is a fingerprint reader or scanner. You’ll first have to program the unit to know which fingerprints to accept, if any fingerprints other than those you set are presented, it will deny access. When you have your prints saved in the system’s memory, all you need to do is insert your finger in the scanner to open the door’s lock. So there is no need for keys or codes to remember and better yet, it won’t allow anyone else access (unless they have your fingerprint), which is unlike combination, code or key lock safes where others can access the safe and the items contained by numerous method – however, that is not within the scope of this article. For a comprehensive list of the best fingerprint safes for guns, see our comparison chart. Here’s a more detailed look at using these safes. These two steps are what will be needed to save your unique access information and later open the unit. Before you’ll be able to use the safe you’ll need to insert batteries to power up the unit. 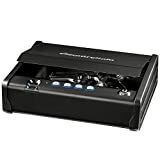 To do this, you’ll use the supplied backup or emergency key to open the safe since the battery compartment will be located inside the device, usually behind the door which is close to the scanner. Once the battery is loaded, you’ll be able to program your fingerprints into the system. To start the programming process, you’ll need to press a reset or record button. This button is often hidden inside the unit, usually close to the hinge of the door. Doing this prepares the system to accept new fingerprints to store. You’ll usually be guided by flashing LEDs or a particular colored LED. When the LEDs light, you can then swipe your finger into the scanner and wait for another light or beep which will tell you if the print has been successfully saved or if it failed. <li&start=”5″>If it the recording is successful, you can use that finger to access the safe later on. The next step is to register the next one (another finger or other person who will have access). If it failed, try again. Note that you’ll want to sit or stand in a position and use the same pressure you expect to use when it comes time to access the unit in real life. You’ll also want to use different angles for each finger and register at least 2 different fingers per person. To see more tips on recording fingerprints see our tips section below. Once you have your fingerprints registered, don’t close the safe door yet. You want to test if it works before doing that. Or else you’ll have to resort to using the key again to unlock the unit. Testing the stored fingerprints goes through the same process as you would when accessing the safe (except with the door open). Usually there will be a wake-up or standby button somewhere in the unit’s control panel on the outside of the door. You’ll need to press this first to ‘wake’ the system up. The button is there is save battery power when the unit isn’t being used so it goes into a ‘sleep’ state. Pressing this button activates the system to be ready to read your prints. Once the system is ready, insert a registered finger in the scanner and wait for the system to beep or give you a light (usually green). Try to use the same pressure, angle and position as you did when you saved the information as this lets it recognize it better. If the fingerprint is accepted the door could automatically open which happens in some models, or you can turn a knob that will unlock the door’s bolts and pull the door open. No need for combination, codes or keys that other people can steal or copy. Only you and those whose fingerprints are registered will be able to access your prized possessions. You’ll need the actual person to be present, no substitutes. It is the fastest way of accessing a safe’s contents. Press the ‘wake-up’ button, insert your finger, the lock opens. Digital locks can be as fast if you have few numbers to press and are fast at pressing, but in times of pressure or emergencies, nerves can get in the way. They also have to ability to store multiple fingerprints. Depending on the model, on the low end, they usually store between 10 and 30 fingerprints, on the high end over 100. So you can save different angles of each of the fingers you wish to use and then have others do the same. Depending on the model you buy there may still be some inconsistencies and can sometimes give you a false rejection, which is rejecting a valid finger that’s used. This is why it’s important to get a brand that is reputable and known to make high accuracy fingerprint safes. They are more expensive when compared to the same model that uses a digital lock, the biometric gun safe version will cost anywhere from 60% to 100% more than the electronic lock model. For example, let’s compare the best-selling Sentry Safe Quick Access electronic lock model vs. the same unit equipped with biometric fingerprint scanner. They run on battery so you’ll need to keep the battery topped up. The good news is most models will not lose their information even when their batteries run out. Just replace them and you’ll still have all the saved data as before. Be careful when choosing because some older models do lose their information which means you may need to re-register the data if you forget to replace the battery in time. Any injury or change to your finger could affect whether or not the system will recognize your fingerprint. This includes, wounds, cuts, and even just having dirty hands. 1. Register / record multiple angles of each finger, and then record different fingers (usually 2 or 3). Multiple angles -This makes access a lot quicker since whatever angle you insert your finger from there is a saved ‘copy’ of that the system can find. Multiple Fingers – In case something happens you one of your fingers, you can use another finger that has been registered to open the safe. 2. As mentioned above, test the lock before closing the door. This will ensure that the system works and that the fingerprints you’ve registered are properly being recognized by the computer program. 3. Use the same amount of pressure, try to insert the finger the same each time and dry your fingers whenever you have them scanned. How much pressure you apply will affect how much of the finger the scanner sees. Whether you insert your finger only halfway in or all the way in makes a difference in which area the scanner reads. Wet fingers, just like anything on your fingers like dirt or lotion can distort the lines the system is trying to read. 4. For security purposes, wipe the scanner’s glass surface after each use. The fingerprints can leave residue marks that may allow unauthorized individuals to lift them using adhesive material. Now it’s time to look at 6 of the very best Biometric Safes on the Market, all of which offer the much sought after fingerprint recognition for the safe storage of your firearms. While biometric gun safes do generally feature a key lock as a fail-safe against batteries dying or electronic circuits giving out, their primary method of unlocking is through an advanced optical sensor that reads your fingerprint and then compares it to an image stored in memory. It’s all very sci-fi sounding, and also very effective. Fingerprints are unique, and the odds of two people having identical fingerprints are so high as to be meaningless to this matter. Suffice it to say, your fingerprint is your very own unique passkey on a biometric safe. With a high quality safe, unlocking it is a matter of moments but there are a few tips and tricks you need to make sure of. First, a biometric safe is meaningless without power. Use good, fresh batteries to keep it running. The power drain is minimal and batteries are cheap compared to the peace of mind of secure gun storage and ease of access. The next care tip is critical and often overlooked; keep your fingerprint sensor clean. A dirty sensor is an unhappy sensor. If it is covered with dust, or grime or oils or some unholy combination of the three, it cannot work as advertised. Best case scenario, it takes longer to read your fingerprint. Worst case, it doesn’t read it at all, and you may have to waste precious time cleaning it or looking for the backup key. While biometric safes are very low maintenance pieces of gear, they are not some sort of install and forget item, especially if you rarely access your firearm. Keep it clean, keep fresh batteries in it, and test the function regularly. It may not seem like much, but one of the primary reasons people choose a biometric gun safe is rapid access over other more conventional methods. This means taking the time to keep your safe maintained and ready to access at a moment’s notice. What exactly is a biometric gun safe? A biometric gun safe is unlike a regular combination lock safe, or key safe in that access to the safe’s content is by way of a fingerprint. The term “biometric” refers to any method for uniquely recognizing humans based upon an intrinsic trait, and in this case, that trait is your fingerprint. Retina scans, often seen in movies, are another type of biometric identification method, but much too expensive and complicated for the small gun safes that cost just a few hundred dollars. Retina scans, often seen in movies, are another type of biometric identification method, but much too expensive and complicated for the small gun safes that cost just a few hundred dollars. 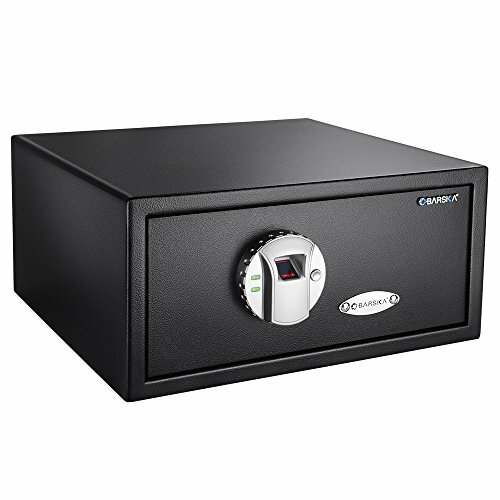 What are the advantages of these electronic fingerprint safes? The advantages are many. Let’s say you suffer an accident such as being hit in the head or need to open a combination lock safe in a hurry. There’s always the chance that you might not be able to remember the combination in an emergency. Keys are often stolen or lost, and combination locks can also be cracked as well. With biometric identification, only you can open the safe because you are the only one with your unique fingerprint. In short, a biometric gun safe offers you an entry system that is practically impossible to tamper with. While combinations and passwords can be lost, forgotten, or stolen, the entry mechanism for the safe is individual specific. Why should I even consider a gun safe or pistol vault in the first place? There are many reasons. No one wants their guns stolen. That’s reason number one. But the more important reasons is safety. Every year there are numerous guns accidents where children get killed because they end up playing with their parents’ guns. In order for your children to be safe yet have quick access to your guns in a time of need, gun safes are convenient for fulfilling these needs. How do these safes work? To open an electronic fingerprint safe, or biometric gun safe, you simply scan your fingerprint across the sensor and the safe will open. Many biometric safes allow multiple users to be programmed into the memory and offer battery backup protection for when you need to recharge the safe batteries. The safes vary in size but are usually large enough to serve as pistol safes storing small guns, like a biometric gun vault, and other personal items such as documents, too. It depends on the size of the safe you buy which can even be fit into a wall. What are some of the most common brands or most popular gun safes? Biovault Biometric Safe with Fingerprint Reader, BIO Biometric Fingerprint SAFE BOX Jewelry Gun Car, BARSKA, Gunvault GVB2000 Multi-Vault Biometric Gun Safe, and Equiam Biometrics® BioVault 2.0 are just a few of the popular models and makers. I understand there are two types of technology used to identify your unique fingerprint. Can you explain the difference? There are two types of scanning method used to identify your unique fingerprint for entry into a biometric gun vault or pistol safe. The first method is an optical scanner method, quite similar to what is used in digital camcorders, that takes a picture of your fingerprint and compares it to an electronic memory record. The second type uses capacitance scanning which measures differences in electrical charge based on the ridges and valleys of your fingerprint to identify your fingerprint. Where can I buy a biometric gun safe? Many gun stores stock them, but the easiest way and often the cheapest is to buy them online. We work with a number of retailers, from Amazon to GunSafes.com. After purchase, they can be installed in filing cabinets, in walls, on boats, in RVs, in home or office, and in desks or nightstands. 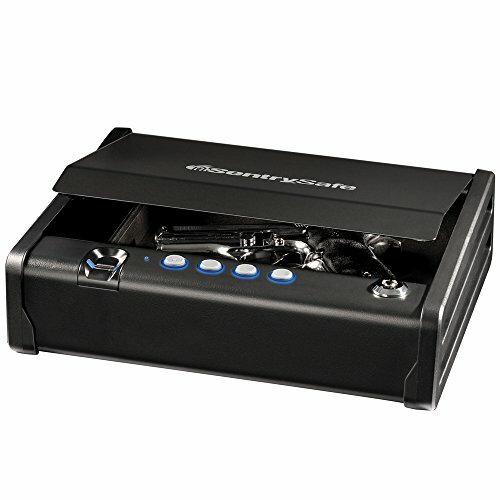 The best biometric gun safes will keep your weapons safe, provide easy access when you need it and have long battery life. Other important considerations are the weight and the size of the gun safe. Be sure to measure your gun length and width to ensure it will fit in your chose safe. If you are a multiple gun owner, look for a safe that offers the ability to store multiple guns, this will save you both space and money. Whilst keeping your firearms safe is a must, using biometrics is only one method of doing so, if the price is a major concern for you, our gun safe buyers guide provides full coverage including those that use mechanical and electronic locking methods.